Here we are at the end of week five and wow have we made progress! Once demo was done, the new stairs were up in just a couple of days! We still can't believe the transformation of the space. It doesn't even feel like the same house! Our contractor did an awesome job at creating the winder that we wanted, too. Of course, it wasn't until the drywall went up that we could really see our vision being pulled together. It looks soooo Scandinavian and modern right now without the newel, railing, trim, stain, paint, yada yada.. I kinda love it! We are also really excited for our new casement window! Since we eventually want to replace all the windows, we styled this one as a model for the rest and to match the original 1920's style of the house. Can't wait to see it! Since our home is almost 100 years old, things aren't exactly straight and a tad slanty, leaving the opening square didn't seem like the best idea. To help with the visuals, we added an arch in place of where the old wall was and it's so beautiful and more than we imagined! I want to arch every opening now! We have a few more weeks ahead of work before the plastic comes down and we can start painting and staining! I look forward to sharing the finished project and to show you what we have in mind for the space! Our almost-100-year-old little bungalow was blessed with a death-trap of a staircase. 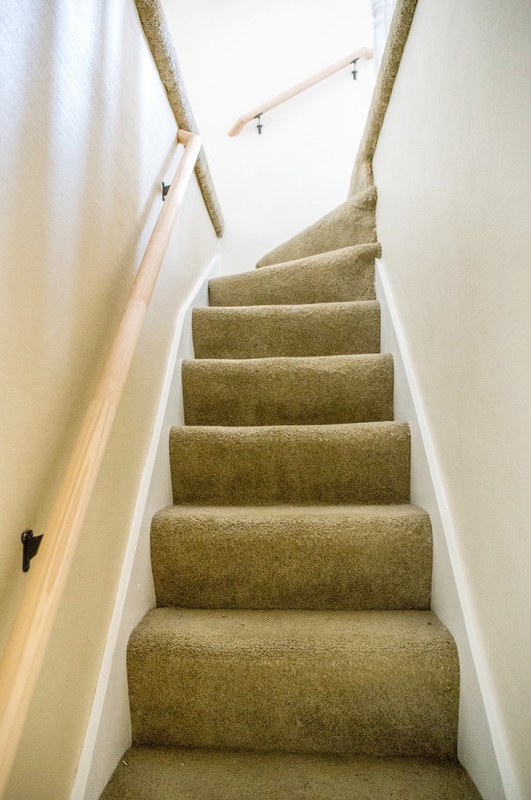 It's steep, tight, low in areas, and even has carpet from I don't even know when. I've had my share of spills down it, and anyone who is over 5'4 is sure to hit their head on the way up or down. Worse yet, if you're trying to carry anything up, there's a point about half way where you have to lift the item above your head, otherwise you slam right into the stairs above you. They are terrible. The worst. I am not exaggerating. AND, again... they are carpeted! YUCK! So, we started to talk about how we can improve these stairs as-is and couldn't come up with any cost-effective way that would actually solve the issue. We had already been entertaining the idea of opening up the wall that separated our living room and the front bedroom. So, why not just move the direction of the stairs while we are it? Genius! 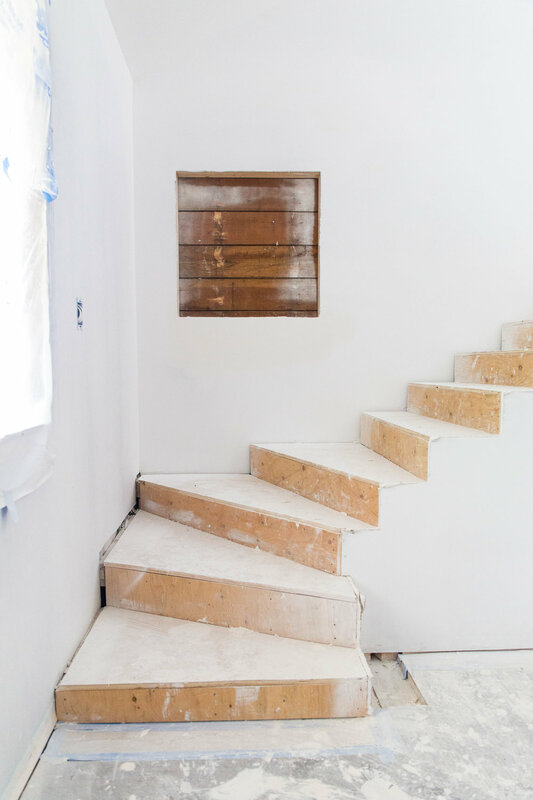 The idea is to have the new staircase follow up the side of the front bedroom wall (this room will later become part of our living room), beginning with a slight turn upward, and then continuing up in a straight path. 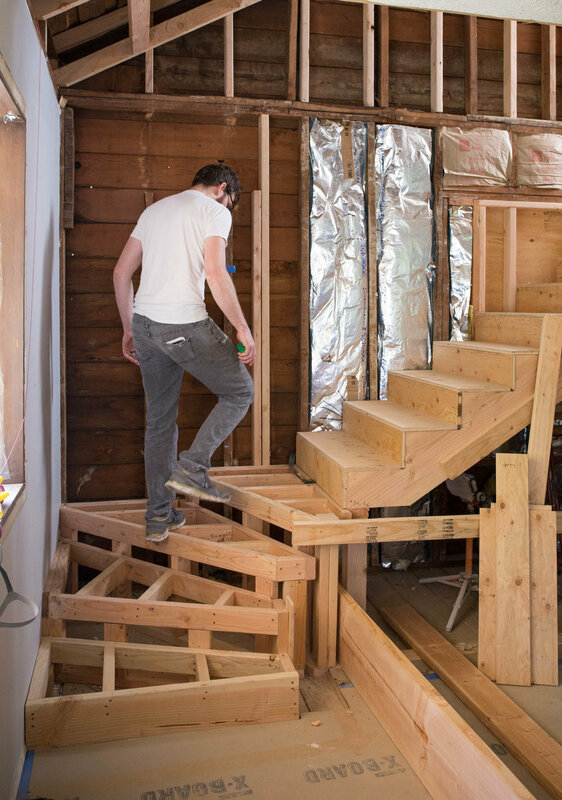 This will give us a longer, more gradual stairway, and allow us to have more room to work with upstairs, eliminating a lot of dead space. Our house also lacks quality closet space, and the current staircase intrudes into our bedroom closet at an angle, cutting off the otherwise usable top right corner and leaving us with an awkward, two-thirds of a closet. So, when we close it up during the new staircase build-out, we are also thinking of re-purposing the current staircase entryway into a walk-in closet, or into built-ins. This major project will not only prevent injury or death to us and our guests, but open up the room, creating a very welcoming appearance (see inspiration photos above), and instantly adding major value to our home. Win-win! We are currently waiting for drawings to finalize with our engineer and are on the books for a mid-to-late April start! Can't wait to update with progress soon! Special THANKS to Bonney Johnson (aka prettygoodpdx) for letting me use her photos of her beautiful staircase - our major inspiration.